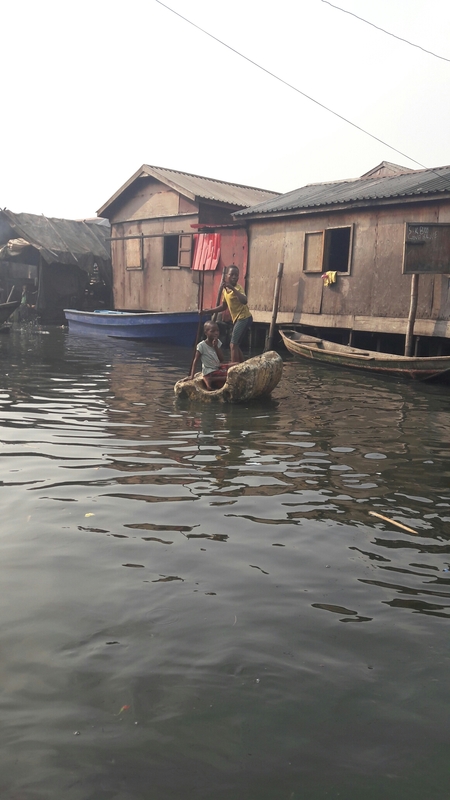 I took this picture in Makoko, the stilt city on Lagos Lagoon. You could call it a slum but it is actually a very industrious neighborhood living of fishing and trade. My goal is not to define what a slum is or to present an incredible hundred year old dwelling where half the population of 100,000 souls speaks French. Enough said, I hope, to lure you to enquire more about Makoko. I was more interested in the boldness and audacious approach of these two courageous boys, who decided, on a Saturday morning, to embark (the word is weak) on a journey of rough navigation with a (very) improvised vessel. But they have a vision: criss to the other side and become good navigators, while their mission today is to stay dry. I cannot refrain from using this picture as a parable to…Nigeria’s current economic situation. better distribute please) wealth in a sustainable manner. It goes without saying that any policy, at federal or state level will have not much effect without tackling the endemic corruption that have set the stage for the lack of political will and commitment to pursue not this but any plan. Nigerian elites should not be held back by the bad conscience of past mistakes and wrong doings. “The Wicked flee when no one pursues but the righteous are bold as lion” (Proverbs 28:1). The innocence, boldness and audacity of these children is to be taken as an example of a New Vision for a New Era. Well said Genco! Very apt observation as an expat in Lagos. I do indeed like your metaphor of the boldness of this boys as related to how Nigeria should approach the future. Ours is a country blessed with vast resources, and I come back to the fact that it CAN be done – it just take the will power (audacity) and belief (boldness). Thanks a lot Lekan. Nice of you visiting my blog. « Educate in Mosques but don’t forget the girls.